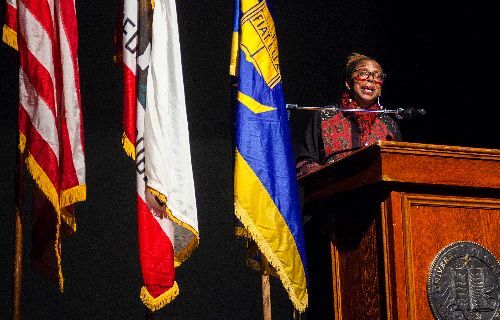 As the lights came up and Kimberlé Crenshaw exited the stage, the raucous applause from a packed house at the Santa Cruz Civic Auditorium was a reliable indicator of the power and insight contained in the speech she’d just delivered. “That’s what happens when you bring it,” said UC Santa Cruz professor David Anthony, who hosted the annual UC Santa Cruz Martin Luther King Jr. Convocation on Thursday night. Crenshaw, a professor at UCLA and Columbia Law School known for the development of intersectional theory, was the keynote speaker for the event and framed the majority of her speech as an imagined dialogue between the ghost of King and contemporary feminist civil rights leader Barbara Arnwine, both of whom are chagrined at the current state of affairs in the United States. “It’s a challenge to speak about the legacy of Dr. King in the midst of what is probably the most profound unraveling of the racial justice agenda that we’ve seen since the end of Reconstruction,” Crenshaw said in her prefatory remarks. At times reading like a play, Crenshaw used the voice of Arnwine to channel her own frustration with the limitations of the 1960s civil rights movement, the Obama era, and their combined inability to incorporate the perspectives and voices of women. Crenshaw criticized King’s position that a better future for black children in America relied on the promulgation of traditional family values, encouraged by job programs for black men. “No one seemed to notice that the best way to secure the social and economic well-being of children of color is to secure the social and economic well-being of their mothers,” she said. This is not to say Crenshaw was dismissive of King, his contributions, or the applicability of his legacy to the current times. Crenshaw praised King for his stand against the Vietnam War despite contemporary criticism from within the civil rights movement, saying it represented intersectionality by recognizing the principles of American imperialism were equally pernicious whether applied at home or abroad. Crenshaw’s critiques were not restricted to the 1960s either, as she decried the male-exclusive focus of former President Barack Obama’s foremost racial equality initiative My Brother’s Keeper. She further said that declarations of a post-racial society in America that greeted Obama’s election led to a relaxation in vigilance that played a role in fostering our contemporary cultural conditions. “Some people are so convinced we are moving forward, that we haven’t noticed we are passing through the same terrain we passed before,” Crenshaw said. For Crenshaw and many other speakers who participated in the convocation, that terrain is the Trump era, which they said provides a stark contrast the principles of inclusion and fellowship espoused by King. Maria Elena De La Garza, who received the Tony Hill Award for Community Service during the convocation, described an ICE raid in Watsonville the day before, and asked her listeners to imagine the fear felt by the children who are watching their parents ripped out of cars and taken away to uncertain futures. Crenshaw also called for action, citing King as the necessary conduit for the hope that dedicated action and diligence can create change. But Crenshaw added that such change will only come by recognizing and honoring the tapestry of interwoven identities of the participants in the movement—a movement that must incorporate women, their perspectives, their voices, and their unique travails in order to progress. The annual convocation, which celebrated its 34 anniversary this year, honors the life and dream of Martin Luther King Jr. by presenting speakers who discuss the civil rights issues of equality, freedom, justice, and opportunity. It also seeks to build partnerships and develop dialogue within the campus and local community.